Approval has been given for a new substation South of Lindfield Station to handle increased train frequencies on the Upper North Shore Line. The line currently has 15 trains per hour in the AM peak North of Chatswood, but the government plans to boost this to 20 trains per hour once the North West Rail Link opens in 2019. This will require additional electricity to power the extra trains on that section of the network. Construction is expected to be completed in 2016. The fourth and final Tunnel Boring Machine (TBM) has begun digging a tunnel for the North West Rail Link (NWRL) and its twin 15km tunnels. The 3 TBMs already in place have collectively dug almost 2.7km of the 30km of tunneling required, excavating 278,000 tonnes of crushed rock. TMB4 Maria, named after 19th century Aboriginal rights advocate Maria Lock, began digging from Cherrybrook in January 2015. Infrastructure NSW released an update to its infrastructure plan in November 2014. Unlike the 2012 report, this one puts a greater emphasis on rail. Here is a (belated) overview of the main recommendations for the rail network. Major upgrades will focus on the T1 Lines, which are expected to see stronger growth in demand than other lines. These include lengthening of platforms, to allow longer trains to stop at certain stations; amplification of track, akin to adding more lanes to a road; and improved signalling, which allows more frequent train services without compromising safety. The longer platforms will primarily benefit intercity train services, with new intercity trains to be 12 cars in length compared to the current 8 car trains. Meanwhile, the business case for improved signalling is expected to be completed over the next 18 months. No specific details are given on where track amplifications will occur. A commonly touted corridor is on the Northern Line between Rhodes and West Ryde, which would upgrade the entire Strathfield to Epping corridor up to 4 tracks. This would allow service frequencies to be increased along this corridor while still maintaining a mix of all stops and express services. Such capacity improvements are necessary for Upper Northern Line trains that currently reach the city via Chatswood to instead be diverted via Strathfield when the Epping to Chatswood Line is closed down for upgrades as part of the North West Rail Link project in 2018. Construction on a Second Harbour Rail Crossing is to begin in 2019, with completion in 2024-25. It has a BCR (Benefit to Cost Ratio) of 1.3 to 1.8, meaning that every $1 spent on the project will produce benefits of $1.30 to $1.80. The total cost will be approximately $10.4bn, with $7bn to come from privatisation of state electricity assets and $3.4bn from existing funding already committed. Additional stations will be considered at Artarmon, Barangaroo, and either Waterloo or Sydney University; which the report recommends partly being funded by beneficiaries of the new stations, a concept known as “value capture” (p. 146). The current plan has the line connecting to Sydenham Station via tunnel, rather than utilising the existing corridor between Erskineville and Sydenham which has been reserved for an additional pair of tracks. Transport for NSW will further investigate the effectiveness of off-peak pricing and improved shoulder peak services on spreading demand. The report notes that, following the October 2013 timetable changes, improved frequencies during the shoulder peak periods (the time immediately before and after peak hour) saw 5% of peak hour journeys shift from peak hour to the shoulder. Transport for NSW notes that this represents “more than two years of patronage growth”, adding however that “this option is not ‘cost free’: additional rolling stock may be required to provide these services on some lines”. Despite these concerns, it is likely that improved efficiency can at the very least defer the need for more expensive capital expenditure to expand the rail network. 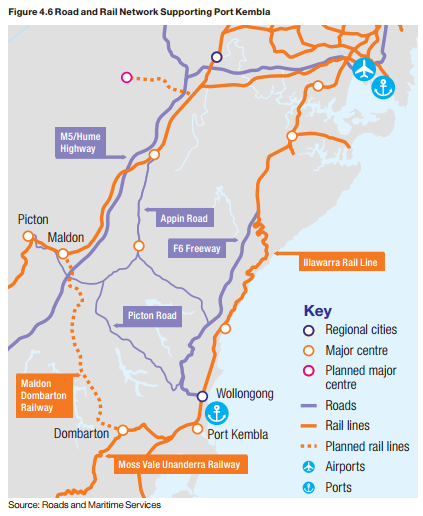 Two light rail projects are discussed, the first being and extension to the existing Inner West Line out to White Bay where significant urban development is planned; which the second is an extension of the proposed CBD and South East Line to either Maroubra (1.9km), Malabar (5.1km), or La Perouse (8.2km). Neither of these extensions have funding attached to them. 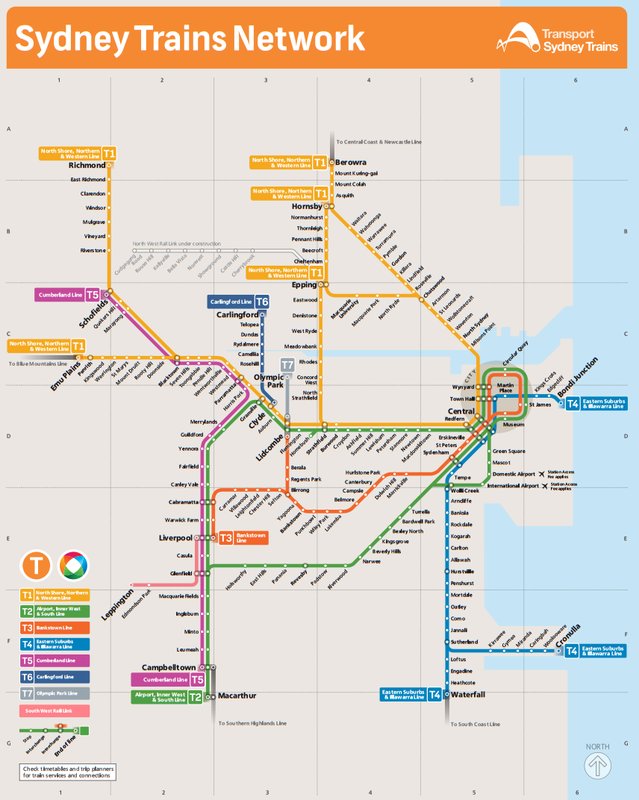 A Western Sydney Freight Line is mentioned, as is a Maldon to Dombarton Railway and associated improvements to the Southern Sydney Freight Line (SSFL). The latter would link up Port Kembla to the SSFL in South West Sydney, thus removing freight trains from the T4 Line in Southern Sydney. Such a move is likely a prerequisite for increase passenger frequencies on the T4 Illawarra Line as well as extending Rapid Transit Services from Sydenham to Hurstville at some point in the future. Commentary: What’s missing and what’s next? 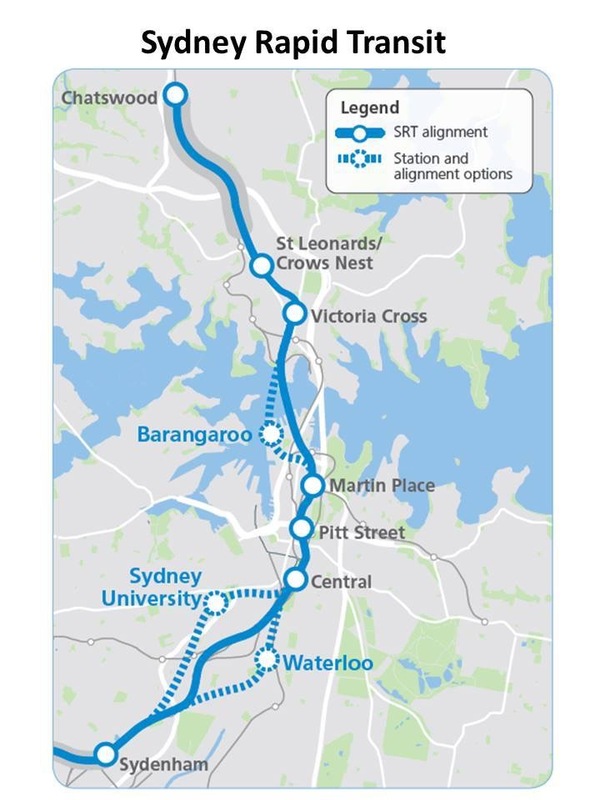 No mention is made of a rail line to the Northern Beaches, the Parramatta to Epping Rail Link, an extension to the T4 Eastern Suburbs Line, or a CBD bus tunnel. The last 2 of these projects were proposed by Infrastructure NSW in its original 2012 report, designed to eliminate the need for light rail through the CBD. With the NSW Government opting to go ahead with the surface light rail option, both of these projects appear to have been dropped by Infrastructure NSW. Infrastructure NSW’s combatative approach also appears to have been dropped replaced with a more cooperative approach to transport planning with Transport for NSW. Whereas in 2012 the Infrastructure NSW report was seen as an alternative to the Transport for NSW Transport Master Plan, and an alternative that focussed more on road based transport rather than rail based transport; this 2014 update reinforces, rather than contradicts Transport for NSW. It’s difficult to look past the departure of Infrastructure NSW’s inaugural Chairman and CEO, Nick Greiner and Paul Broad (both strong advocates for roads and road based transport), when looking for a reason why this may have happened. Looking towards the future, the $20bn privatisation of 49% of the electricity distribution network in 2016 will provide funding for a decade – in particular to fund the construction of the Second Harbour Crossing, $7bn from privatization money is to be added to the existing $3.4bn allocated to it, with construction to begin in 2019 and the project completed by 2024-25. If the Premier Mike Baird has his way then construction will begin in 2017, potentially fast tracking this project to 2023. This would be 4 years after the opening of the NWRL, a welcome change to delays and deferrals that NSW has become used to. Additional expansions of the transport network that come after that are currently unfunded and uncommitted. 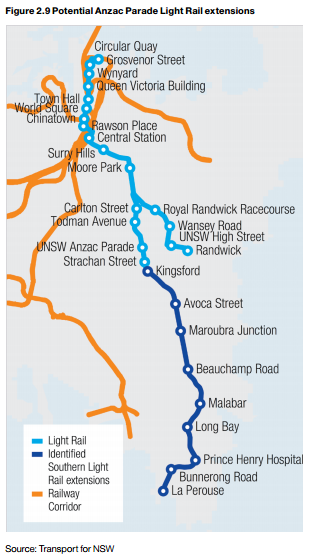 These include any extension to the North West and South West Rail Links, light rail to Maroubra and White Bay, and the Outer Western Orbital Freeway. One option is that the remaining 51% could be sold off to pay for it. Alternatively, these projects could be funded out of consolidated revenue, built at a slower pace than would otherwise be the case. Following the coming decade of strong additions to Sydney’s stock of infrastructure, this may be an acceptable option. Either way, the 2015 election will not settle the debate over privatisation. This will be an issue that will remain on the table for decades to come. Long delays were felt by people travelling into and within the CBD on Monday morning, particularly by bus passengers on the Harbour Bridge, following a number of simultaneous incidents. A number of roads were closed during 27 December to 12 January as part of the CBD and South East Light Rail project. A cable that manages traffic signals was hit by work crews at the corner of Bridge and Grosvenor streets, preventing traffic light phasing from being changed and causing further delays. A breakdown during peak hour in the southbound lane of the Sydney Harbour Tunnel diverted more cross-harbour traffic on to the bridge. In addition there was a crash at 8:15AM approaching the Sydney Harbour Bridge and a motorcycle breakdown that blocked the bus lane at 9:00AM for a short period. 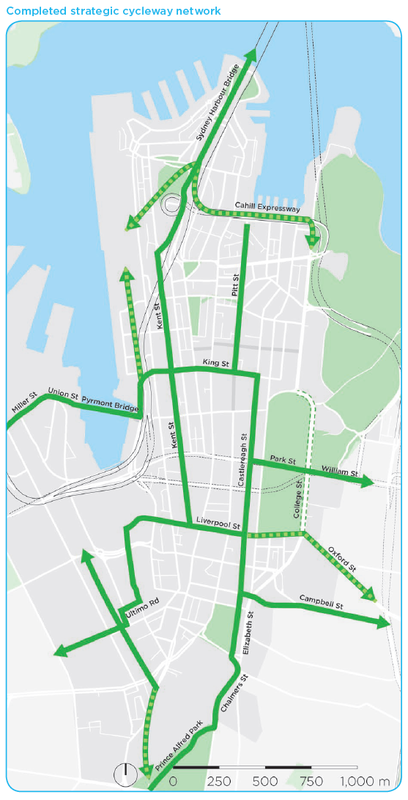 Changes to the CBD bus network, required due to the imminent closure of George St to allow for construction of the CBD and South East Light Rail, have not yet been finalised according to a report by the Sydney Morning Herald. Construction is to begin shortly after the Centenary of Anzac Day in April of this year. George St is also set to be pedestrianised, meaning that buses will not be able to travel along George St even after construction is completed. Work is to begin this month on separated bike paths on Castlereagh St and Liverpool St in the Sydney CBD. Separated bike paths already exist on Kent St and York St, while a third bike path on College St is set to be removed once the Castlereagh St bike path is complete. Previous plans to make the Castlereagh St bike path a “part-time” bike path by allowing loading zones on them at certain times of the day appear to have been dropped following opposition to the proposed plans. The South West Rail Link will be represented by the salmon on the rail map. Passenger indicator boards installed at Liverpool Station in preparation for the 8 February opening of the line display the colour salmon, with trains stopping at Glenfield, Edmondson Park, and Leppington. Trains will initially run as a shuttle service between Liverpool and Leppington. A fire in the Sydney Trains signal control room shortly after midnight of New Years Eve caused all trains to temporarily shut down. Trains began operating soon after, but caused significant delays for the large numbers of people wanting to return home soon after the Sydney Habour fireworks. The South West Rail Link is set to open on Sunday 8 February, with services initially to be every half hour between Leppington and Liverpool. These services will be extended in future, depending on demand, as Sydney’s South West is further developed and more residents move into it. Services could be extended to Parramatta via the T5 Cumberland Line or to the CBD via either the T2 South Line, T2 Airport Line, or T3 Bankstown Line. 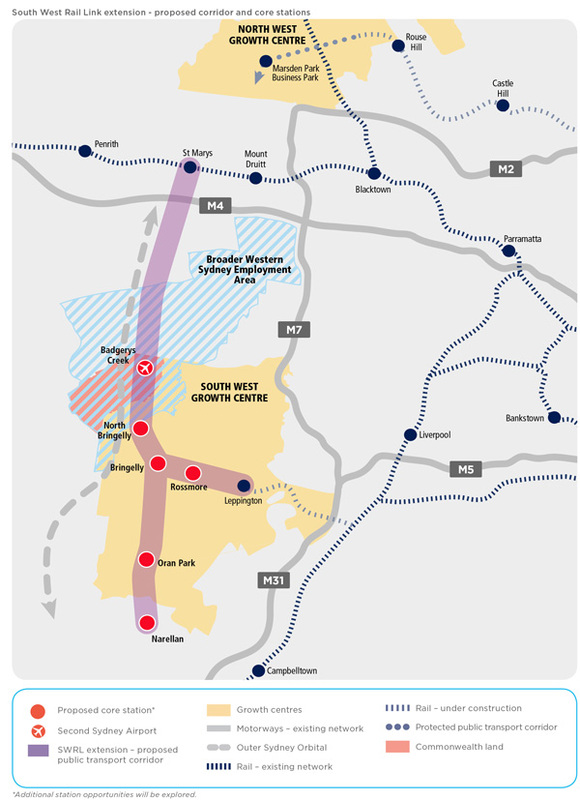 The line itself may also be extended to a future airport at Badgerys Creek and then further to St Marys and/or Narelllan. Just joined Gladys to announce the South West Rail Link will open on 8 February – one year ahead of schedule and $300 million under budget.